ST. GEORGE — Here are the results of tonight’s Region 9 games. 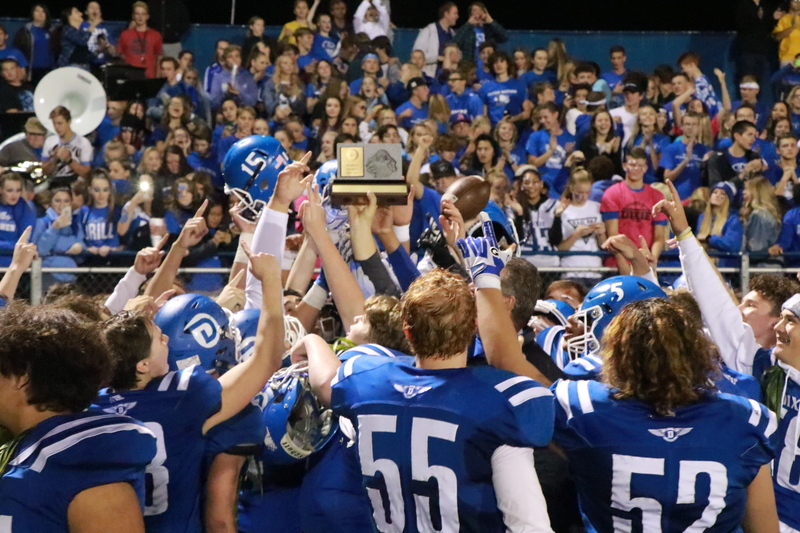 The Dixie Flyers won the Region 9 championship Thursday night with a 21-7 victory over the visiting Desert Hills Thunder. 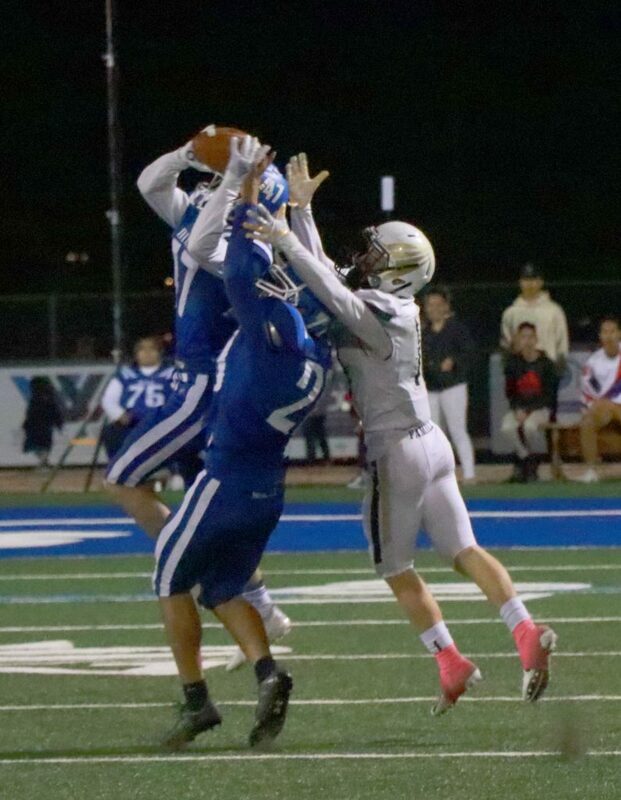 Both teams had entered the regular season finale with unbeaten region records, but Dixie combined a steady offense with a workhorse defense to emerge with the decisive win. “We challenged all three – special teams, offense and defense – just to do their job and they got it done tonight,” Monkres added. The game started slowly, with neither team able to score in the opening quarter. Dixie missed a 24-yard field goal at the end of its first possession. Early in the second quarter, Desert Hills followed suit, missing a 35-yard FG attempt that went wide right. On its next possession, however, Dixie drove the length of the field, an 80-yard drive that culminated with a 1-yard TD run by Westin Banuelos. Kicker Joshua Stewart’s PAT attempt was good, putting the Flyers ahead 7-0. Both teams punted on their next possessions, but the Flyers snagged a key interception with under three minutes to play in the first half, setting up another TD run, this one a 10-yard run on fourth down by quarterback Reggie Graff that gave the Flyers a 14-0 halftime lead. 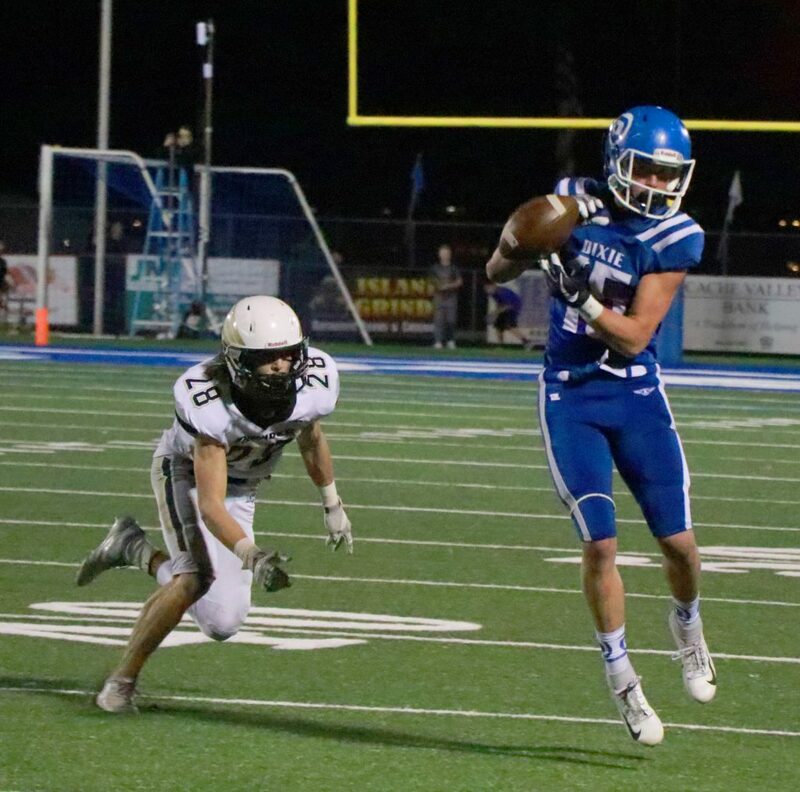 Dixie kept the momentum going in the third quarter, scoring its third TD on a 22-yard scoring pass from Graff to Nate Mahi on fourth down and four, putting the Flyers up 21-0. 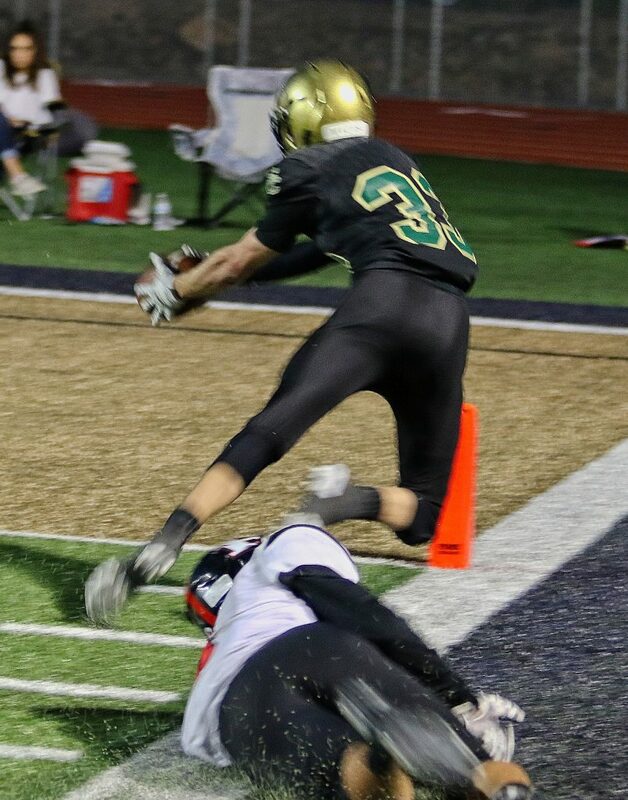 In the fourth quarter, the Thunder were finally able to get on the scoreboard with a 13-yard run by Michael Barben with just under four minutes left. 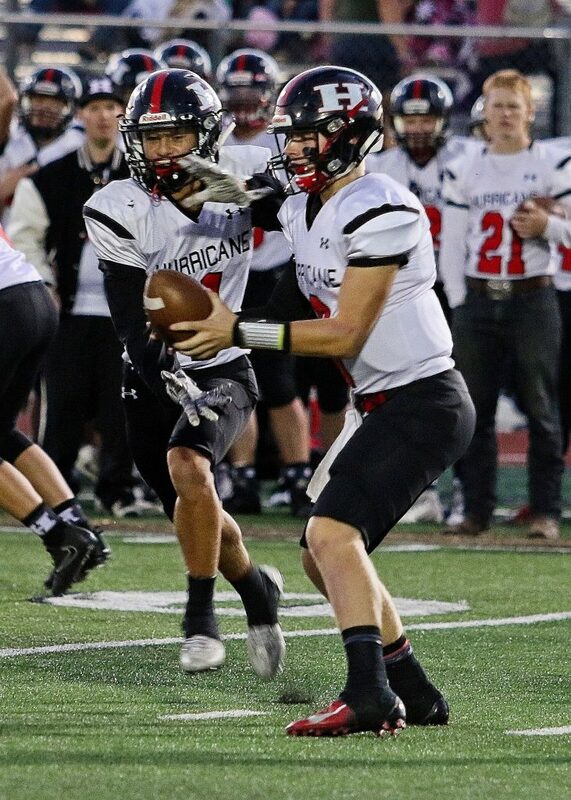 Desert Hills’ ensuing onside kick attempt failed, however, and Dixie was able to run the remaining time off the clock during its final two possessions, helped by a game-clinching interception by Harrison Beazer in between that ended any hopes for a miracle Thunder comeback. Dixie’s players held aloft the region trophy after the game, celebrating the big win along with their coaches, staff, cheerleaders and fans. Both teams will host opening-round games next Friday, Oct. 26. Dixie will play Green Canyon, Region 12’s No. 4 seed, while Desert Hills will host Mountain Crest, the No. 3 seed from Region 12. 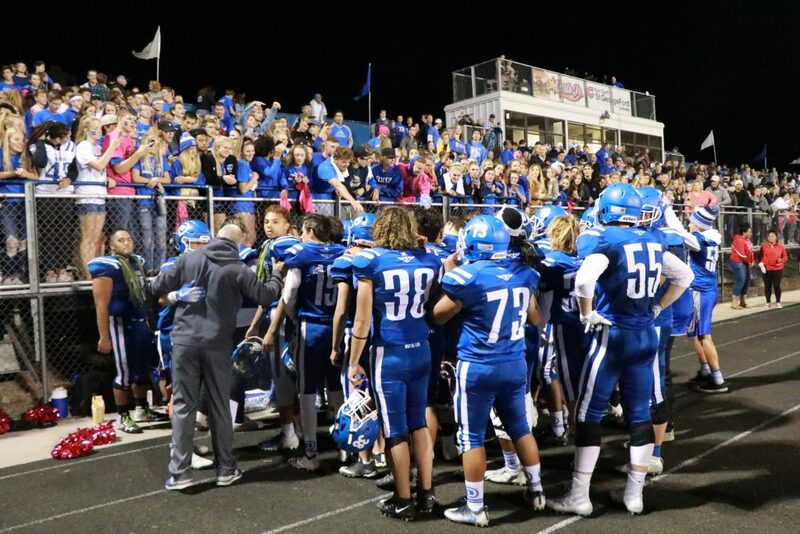 Dixie’s game will start at 7 p.m. (moved from the original 4 p.m.), while the kickoff time for Desert Hills-Mountain Crest game has been scheduled for 6 p.m. Check back on St. George News next week for previews on all four playoff contests involving Region 9 schools. In its final tuneup before the playoffs, the Snow Canyon Warriors made easy work of Hurricane, winning 40-6. 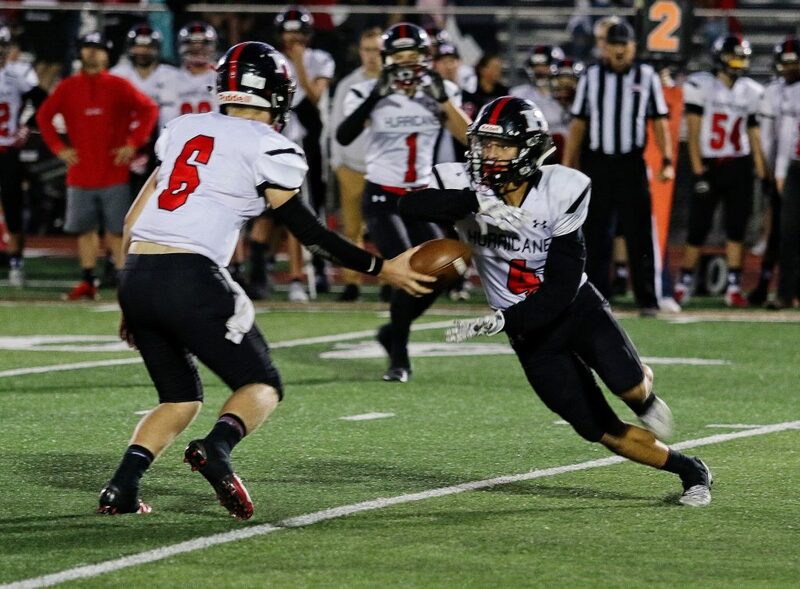 The Warriors took an early lead in the contest after capitalizing on a Tigers turnover when Miles Reynolds returned an interception for a touchdown and a 7-0 lead. 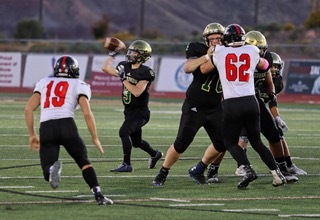 Snow Canyon added to its lead only two minutes later when quarterback Landon Frei ran 15 yards for a touchdown. The Warriors extended the lead to 20-0 when Landon Frei threw a 42-yard touchdown pass to Austin Anderson. Snow Canyon added another score in the early part of the second quarter via an 11-yard run by Jase Mendenhall. The Warriors made the score 34-0 just a minute later when Tui Kanosh recovered a Hurricane fumble inside the 10-yard line, returning it to the end zone for another touchdown. The Warriors recorded two field goals in the third quarter and early in the fourth to take a commanding 40-0 lead before the Tigers scored their lone touchdown of the game when Brock Starley connected with Raymond Cordova from 10 yards away with under two minutes to play making the final score 40-6. The Warriors were led by their rushing attack, gaining 105 yards on 28 carries. Frei completed 7 of 11 passes for 124 yards and a touchdown, and rushed for another score. Not to be outdone by the offense, the Snow Canyon defense forced four turnovers, returning two for touchdowns. With the loss, the Tigers finish the season 0-9 overall, 0-6 in Region 9 play. The Warriors finish the regular season 4-5 with the victory, including a 3-3 mark in Region 9 play, good for fourth place and a trip to the postseason. The Warriors now turn their attention to the state playoffs where they will travel to Smithfield to take on the Region 12 champion Sky View Bobcats. That game will take place Friday at 4 p.m. In the final region battle of the season, the Pine View Panthers emerged victorious before its state playoff game next week. The Panthers took the lead at the end of the opening quarter when running back Tosh Wright ran it into the end zone from four yards out for a 7-0 lead. Cedar wasn’t going to make it easy on Pine View though, tying the game at the 7:02 mark of the second quarter when Jaxon Garrett threw a 19-yard touchdown pass to Tayvien Brown. Pine View took the lead back right before halftime, taking a 14-7 lead into the break via a 4-yard touchdown pass from Macloud Crowton to Daylor Rymer. After a close first half it was all Panthers in the second half. After just a field goal in the third quarter, the Pine View offense exploded in the fourth, scoring 24 points. It started with a second Crowton touchdown pass to Rymer, this time from seven yards away for a 24-7 advantage. The Panthers scored again at the 7:15 mark of the fourth when Dallin Brown broke off a 9-yard touchdown run, giving Pine View a 31-7 lead. After a Redmen touchdown, the Panthers added a a 3-yard rushing score from Wright and a 30-yard field goal by Connor Brooksby before the final whistle blew, running away with a 41-13 win. With the loss, Cedar ends the season 3-6 overall, just 1-5 in region play. With the win, Pine View ends the regular season with a 6-3 record, 4-2 in Region 9, good for third place. The Panthers will now take on Region 12 No. 2 seed Logan High in the first round of the 4A state playoffs on the road. The game will take place Friday at 4 p.m.